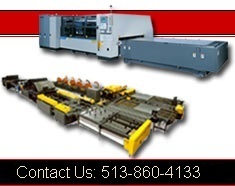 Norlok Sheet Metal Clinching / Fastening | Norlok Surelok Fitting Machine | Cincinnati Precision Machinery, Inc. The "Fitting type" SURELOK features a one-piece 11" throat, steel "C" frame bolted to a solid steel lower arm. This clinching machine is specifically designed to fasten two ply of material together, as used in the sheet metal fitting manufacturing industry. Pipe Diameter 4"Ø Reach into pipe 6"
Pipe Diameter 5"Ø Reach into pipe 11"
Production punch assembly ---Our best tooling with longest punch and die life, best part access, best material range, and easily modified. The standard floor mounted machines are guaranteed to outperform the competition. 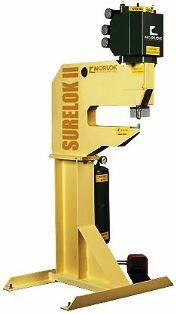 The SURELOK II E series machine is our basic entry level machine that offers proven clinching technology. 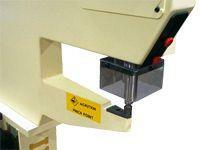 The SURELOK II P series is our production oriented machine. Successor of our SURELOK II E series machine, the P series offers greater clinching versatility and is able to fasten material from as thick as 14 gauge to as thin as 32 gauge. Proven clinching technology you can count on. The SURELOK II E and P Series’ operating features and versatile designs offer solid and reliable machines that become your go-to clinching solutions. Introducing Norlok's newest floor mounted problem solver with a 25” throat. The new SURELOK III is designed for all clinching applications and is faster, smoother, quieter and uses less air than ever before. This stainless steel ready machine offers a no hassle 2 minute changeover for efficient operation and production. Clinches material with 5 tons of force smoothly and efficiently using only 90psi shop air. Tooling adapters designed for sheet metal work that needs a 5 ton press. Self Piercing Rivet kit available for any SURELOK III to join aluminum composite materials, TPO and PVC coatings. No pre drilled holes required. “Intelligent” Safety stroke: Reduces pinch point to less than 1/4" (6.4mm) even with 2 1/2" (64mm) stroke. Extended Warranty: standard warranty is 3 years (punches and dies excluded).